Lexi and Beth here from Crowded Kitchen. 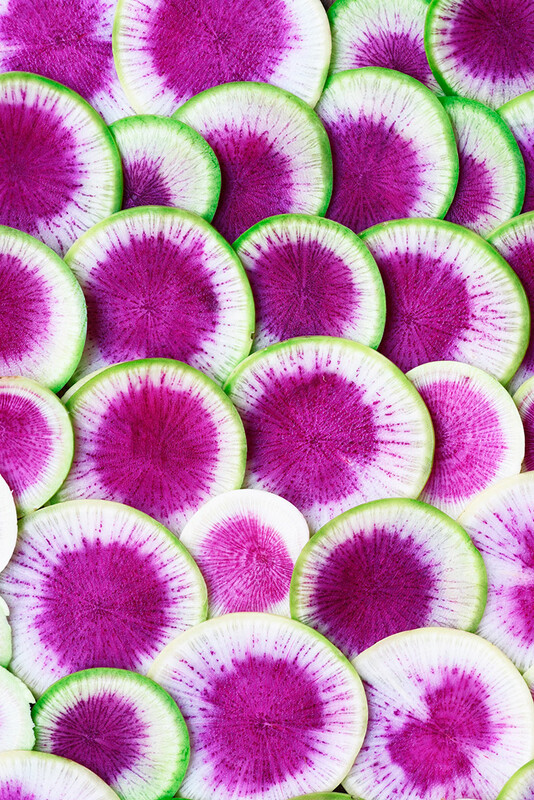 We’re super excited about today’s post highlighting one of our all-time favorite produce items: Watermelon Radish! Watermelon Radishes get their name from their gorgeous pink inside and outer green skin, which, surprise(! ), resemble a watermelon! They’re slightly firmer than your average red radish, but a bit less peppery, making them a fantastic addition to salads. The vibrant pink hue varies from radish to radish - we were lucky to find some deep pink ones earlier this winter (see above), but unfortunately haven’t had quite as much luck in recent weeks. The ones we used in today’s recipe were a bit less saturated in color, but certainly tasted just as great! We’ve found that they’re one of those veggies even picky kids will eat - especially if they love pink! 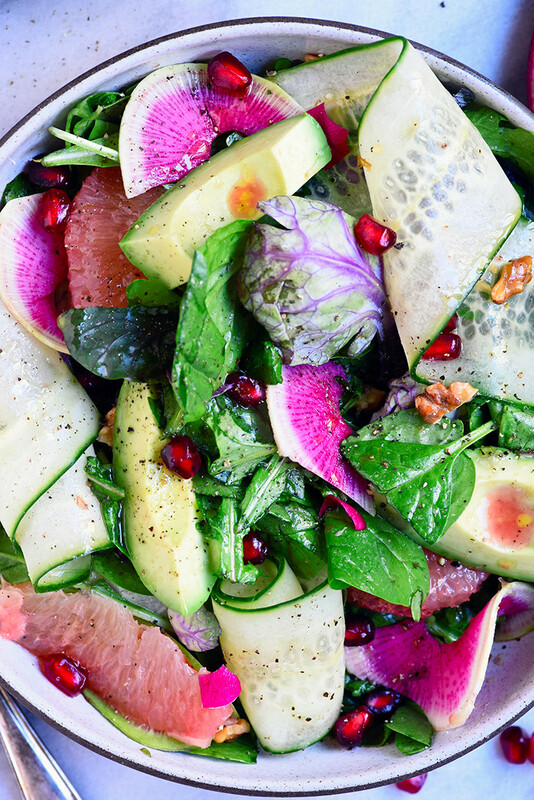 They make a particularly great addition to this Cucumber, Grapefruit & Avocado Salad - we made it all winter! Moving on to this recipe...for those of you that meal prep, you probably know how important it is to switch things up every once in a while - texture and color included! 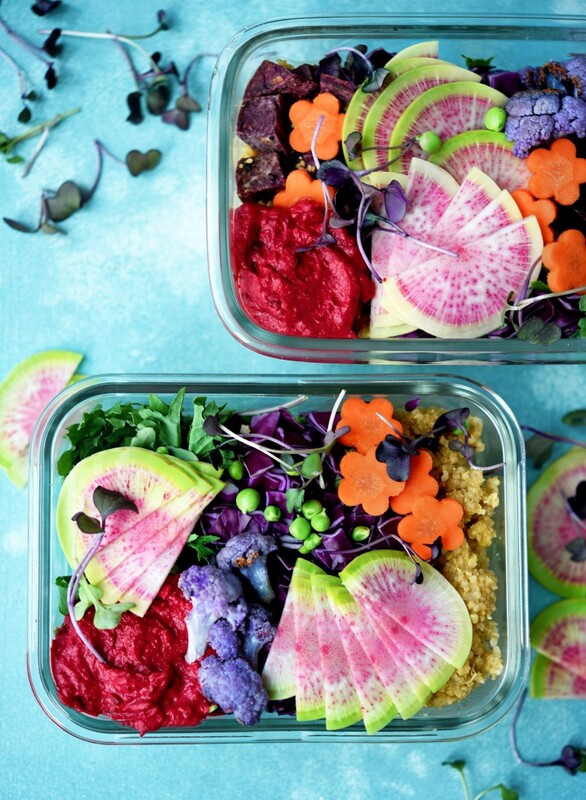 For these meal prep bowls, we made a big batch of quinoa, prepped a bunch of veggies (some roasted, some raw) and added beet hummus. The bowls can be assembled in less than 30 minutes and then sealed and refrigerated for the following day’s lunch! Optional but suggested additions include avocado, lentils/tofu, and hard or soft-boiled eggs. It’s really up to you and your preferences! *This is the beet hummus recipe I love. Or you can do even simpler and roast a small beet and blend it up with store bought hummus. Dice sweet potato and cauliflower into 1 inch cubes. Transfer to sheet pan and drizzle with a bit of olive oil, salt and pepper. Roast for 20 minutes, or until fork tender. Assemble your bowls, starting with your quinoa and greens. Then top with finely sliced watermelon radishes, red cabbage, carrots, roasted veggies, beet hummus, and microgreens + peas. Can be stored in the refrigerator for up to 48 hours.